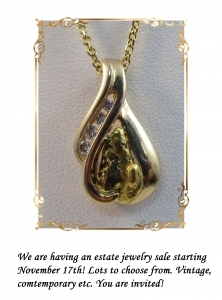 We are having an Estate Jewelry Sale starting November 17th (many items available now). Lots to choose from, Vintage, contemporary, period pieces, etc. You are invited. We sell Estate Jewelry on Consignment and we have plenty of wonderful items for you. We try to preserve or reuse as many pieces of jewelry as possible rather than just melt them all down. We offer this service to our customers so they can find a new home to wonderful jewelry that was previously loved but fell out of the rotation for some reason. We have so many special pieces now that we want to have a special event to show them all.